I'm slightly very ashamed to say that recently I suddenly realised that I'd had my Benefit Boi-ing for years, and I do mean years. I'm not sure how long ago Benefit changed the packaging of Boi-ing from the all black hinged compact to the screw off lid with the clear top, but mine still has the old packaging. As this is a 'stick your finger in it' product I shudder to think what might have been lurking in there and as I often use this for concealing blemishes and scaring on my chin, which is where I mostly suffer with breakouts, I thought this probably wasn't helping. So in the bin it went. 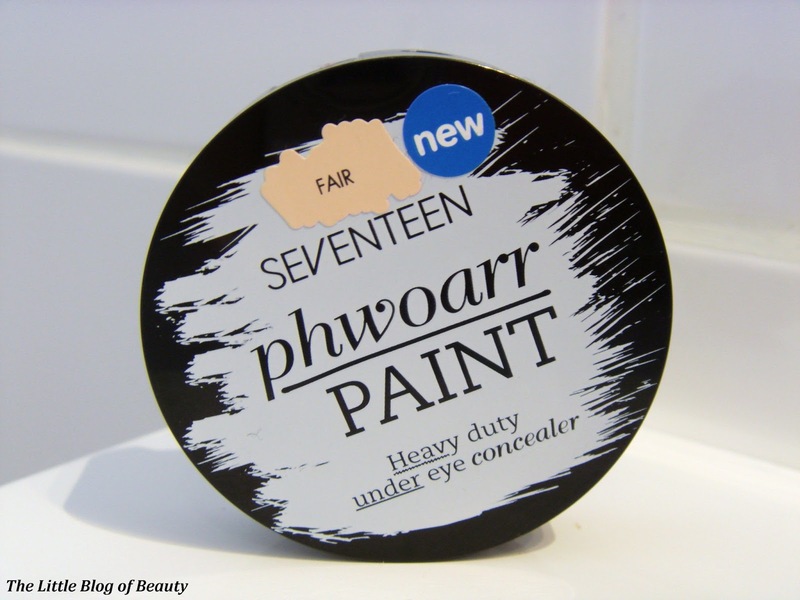 Obviously I'd heard of Seventeen's Phwoarr paint and during one of my wanders round Boots I stopped at the Seventeen counter to take a look. I was disappointed to find something that I'm finding an awful lot recently, and that was an almost empty and very messy display. I had a quick look at the fair tester and decided that it was what I wanted. There was one fair product there so I thought my luck was in, until I noticed that the small seal was broken and when I opened it up I discovered it was more used than the tester was. I know it's annoying when you want to test a product and there's no tester there but come on people, you've got to stop opening products, it's not fair. Boots is not so bad but I think every product I've ever bought from Superdrug (which is admittedly not many as I'm not keen on shopping in Superdrug) I've got home and realised its already been opened. Anyway, when I got home I took to Twitter to have a moan about this and the very lovely Zoe (she's very lovely!) from Face Value Beauty Blog tweeted back to say she had one in her blog sale that I could have if I paid the postage. So obviously I took her up on her kind offer. If you don't already follow Zoe make sure you head over and have a look at her fab blog. Phwoarr paint is obviously a very similar product to Benefit's Boi-ing, but is around a third of the price. Apart from the design on the top the packaging is also very similar to Boi-ing's previous packaging, featuring a hinged compact with a mirror in the lid. Although I haven't seen Boi-ing's new packaging in person I'm assuming because the lid is now see through this no longer includes a mirror, which could be quite annoying if you like to carry your concealer with you to touch up through the day. This is a 'solid' concealer that can feel a little touch to begin with but it soon softens and melts slightly under the heat of your finger. 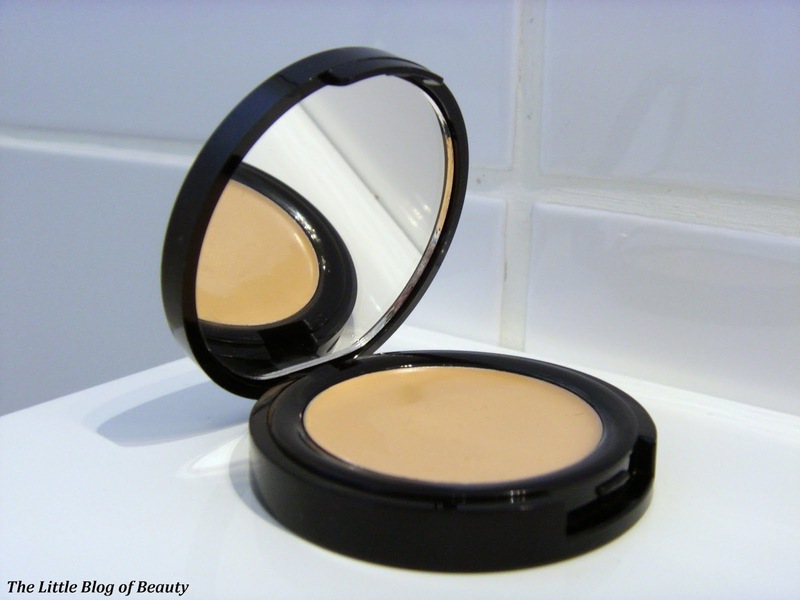 This is designed to be a heavy duty concealer for the under eye area. You may have heard me mention before that my dark circles are industrial strength and they really do take some covering. I know many people would say it's best to apply concealer over the top of your foundation but I actually prefer to apply it underneath and then I top it up slightly over the top as well if required. I use my finger to either pat this on or very gently smooth it over my under eye area. I also apply this on each side of my nose up next to each eye as this area is also often dark and needs brightening up. I haven't tried using a brush to apply this as I think you do need the heat of your fingers to loosen it up. I don't think this quite covers my dark circles completely but it does do a very good job and although I don't think this lasts me all day it does stand up very well up to about 4 or 5 hours and even then I wouldn't be too worried about topping it up as it still looks ok. Although this is only intended as an under eye concealer I do also use it to conceal blemishes and find it very good for this as well. It completely covers any red blemishes or scaring I currently have on my chin but does need topping up every few hours as my chin starts to produce oil to try and push my makeup off. This is where I'm pleased about the mirror as I can pop this in my bag and whip it out whenever required for a quick top up. If you're a fan of Boi-ing or just want a good all round concealer I would definitely recommend this and I personally think it's just as good, if not maybe slightly better than Boi-ing (although obviously my Boi-ing was ancient and possibly well past it's best!). Phwoarr paint is just £5.49 and is available (hopefully sealed and untested) from Boots. Ah that's really nice of her. I hate when make up stands are all messy! And when someone had broken the end of a lipstick and made it all mushed! grrr! Ahh so glad that this blogger community is working out and we can support each other! 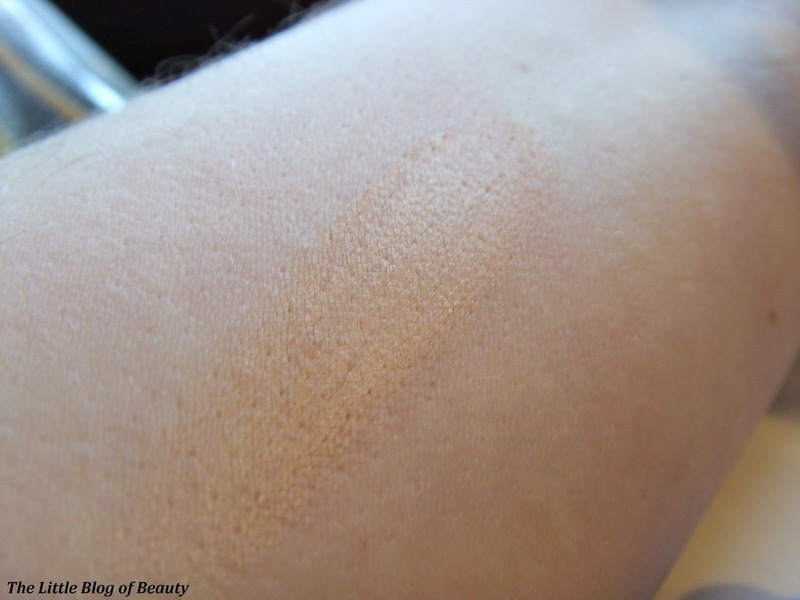 I use the Medium shade and I find that it lasts longer if I dust a setting powder on top. I use urban decay razor sharp finishing powder !